The 74 will be tracking gun-related injuries and deaths at schools throughout 2018. Bookmark this page for the latest reports, or sign up to receive updates straight to your inbox via The 74 Newsletter. One person was killed and another was injured in a shooting on a South Carolina college campus Friday evening during a homecoming event. The shooting unfolded at Voorhees College, a private, historically black college in Denmark, South Carolina. Both victims were young men, but neither were students, according to an advisory on the college’s website. A suspect hasn’t been identified. 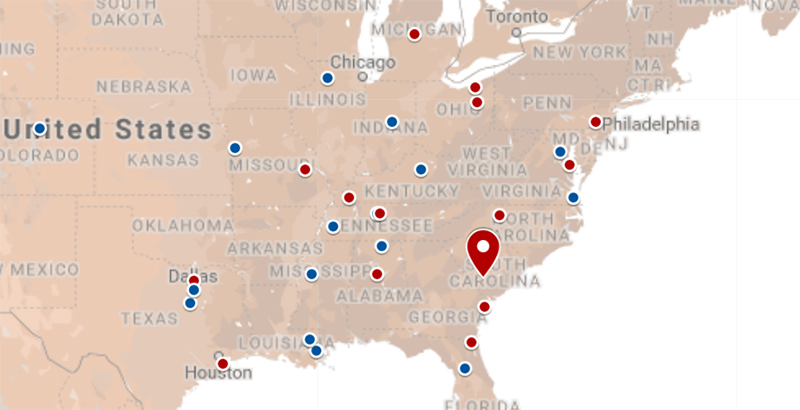 This map includes school shootings that took place on campus where a person was injured or killed. Incidents resulting in injury are labeled blue, while incidents resulting in death are labeled red. The most recent incident is indicated with a larger icon. Click on the icons to see details about each incident. Nationally, nearly 1,300 children (17 years old and younger) die from gunshot wounds each year and 5,790 are treated for injuries, according to a recent Centers for Disease Control and Prevention report. While unintentional firearms deaths and homicides of children have decreased in recent years, suicides have spiked. If we’ve missed a school incident you think should be included in our coverage, please send an email to info@the74million.org, and bookmark this page for the latest reports of incidents involving the discharging of a firearm on school property that results in a wound or fatality.